Grade 3 isn't often when people find their "ah ha" moment, but looking back 15-year-old Mandy Maher says it was a defining time in her young life. Now a student in Grade 9, who lives in North Kamloops, Mandy was just 8 years old when a teacher at her school recognized her potential to perform after watching her in a school talent show and referred her to a community choir. "I love singing. I can't explain why. I tried soccer, ballet, karate, but it never felt like a fit. As soon as I got into that choir I thought this is where I am supposed to be." Today, Mandy says the connection between her love for music and the place where she grew up – Kelly Adam Manor owned by Kelson Group – are strongly linked. "Growing up in an apartment and seeing my friends in houses when I was little, I admit, I was jealous. But now that I am older, I realize this place didn't limit me. It taught me things about hard work, about people. I don't think I could have done any better." Her musical endeavours have included playing the oboe, piano, and tenor saxophone in addition to her first love of singing. While she'll sing anything, her preference is for classical music where she can challenge herself and improve her range. The years of practice and dedication have paid off as Mandy's world is now filled with various musical opportunities. 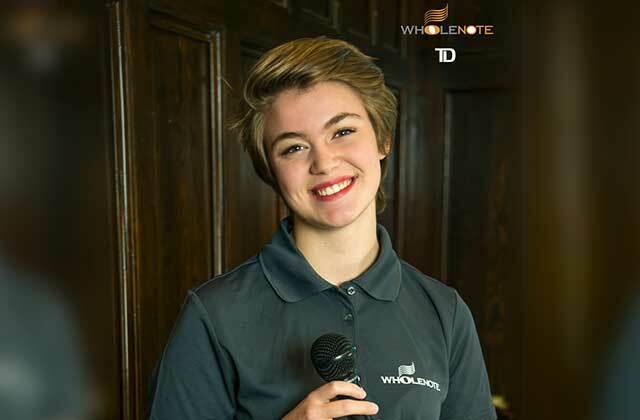 She continues to sing through the Kamloops Thompson Honour Choir, participates in her school drama and music program, takes voice lessons and, most recently, was chosen as a successful applicant in the Whole Note offered through the Kamloops Music Collective. The program provides free music lessons and tuition to cover attendance at the Kamloops Interior Summer School of Music, all of which give Mandy additional opportunities to pursue her passion. Through it all, Mandy says she recognizes the importance of the things that she has gained through her biggest supporter, her mother Sandy, who has worked very hard through the years to make sure Mandy could pursue her artistic hobbies. "I wouldn't be where I am if I didn't have my mom. I think my experiences have made me more humble about the world around me. I have a roof over my head. I have had a happy childhood filled with things I love." And Mandy has big plans for her future in music, too. "I want to teach music. I admit I always loved being the spotlight and love singing, acting, dancing, and playing instruments. But I am a "knit-picky" person. I want to be the director." In her pursuit towards this goal, she plans to serve as an instructor in a new after-school program being developed in North Kamloops for kids interested in drama, performance, and art. She's also thinking about post secondary opportunities in the form of a performing arts degree and hopes to visit universities with her voice teacher over the next year to learn what is involved. Finally, Mandy says she is going to try her hand at busking through the summer in Kamloops. "In the music community I am well known by educators, but I would like to branch off. Experiencing different things is what makes you grow. "